Looking for a delicious pork stew recipe? Your search stops here! Not only is this Instant Pot Pork Stew recipe delicious, it is ready to eat in no time, thanks to the Instant Pot! 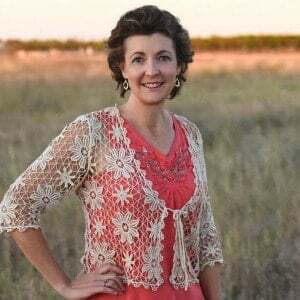 Plus, there are Paleo, Keto and GAPS diet options – a real food recipe from scratch and sure to please! I don’t know about you, but we rarely eat pork. Beats me as to why, after all, it is so good. I love bacon and pork loin and definitely buy them when they are on sale. That is how this recipe came into existence – pork was on sale. And, like most other grocery items, when I find them on sale, I stock up! Remember freezing avocados? 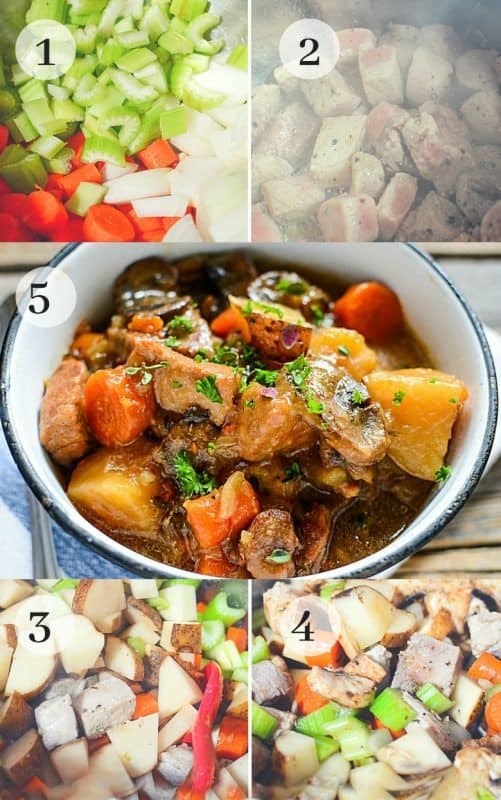 This Pork Stew is super easy and with the addition of carrots, potatoes, onions and mushrooms is a one dish meal – I love that! But, I rarely stop there – it is just too easy to add a salad and homemade bread! Sourdough bread bowls are delicious and there are fewer dishes to wash after the meal because you eat your bowl! What Pork Can Be Used for Pork Stew Meat? The following recipe used pork chops but really any pork can be used. Chops – Which is the cut I used because they were on sale! Pork loin – A thicker cut from which steaks can be cut – see Easy Pork Loin Recipe. Pork tenderloin – This is not cut from the same part of the body as the pork loin – it is thinner and smaller. Is Instant Pot Pork Stew GAPS, Paleo & Keto? 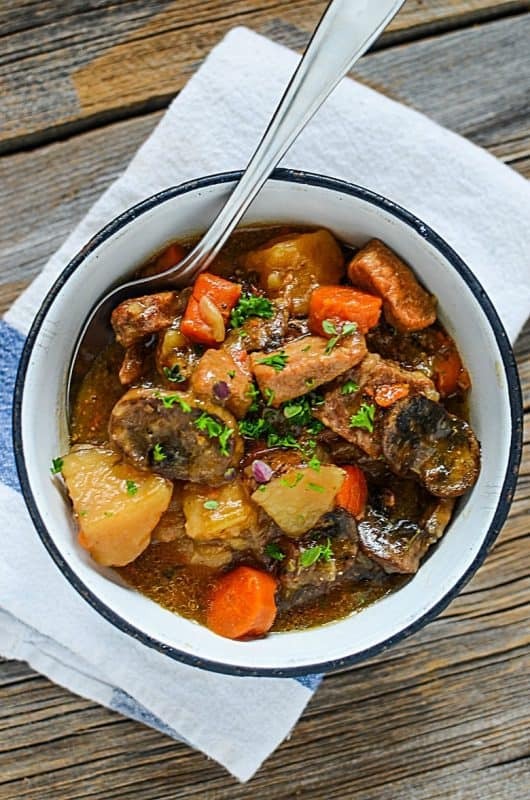 This Instant Pot Pork Stew recipe can be made GAPS diet, paleo, and keto by leaving out the potatoes and instead of using a packet of gravy mix, add your own spices. It is delish! Not familiar with an Instant Pot? An Instant Pot is a multi-functional kitchen appliance that can be used as a pressure cooker, crock pot, yogurt maker, rice cooker and much more. I use mine several times a week. I have the 8 qt Instant Pot and although you may not feel you need the larger size, it does come in handy. Just think, you can make a big batch of pork stew and freeze the extras. Plus, I can cook as little as 1 cup of rice in mine! Personally, I think every kitchen needs at least one! 1. Buy pork chops (or other cuts) on sale and freeze them to make this even more economical. 3. Homemade chicken broth makes this even more delicious and healthy. 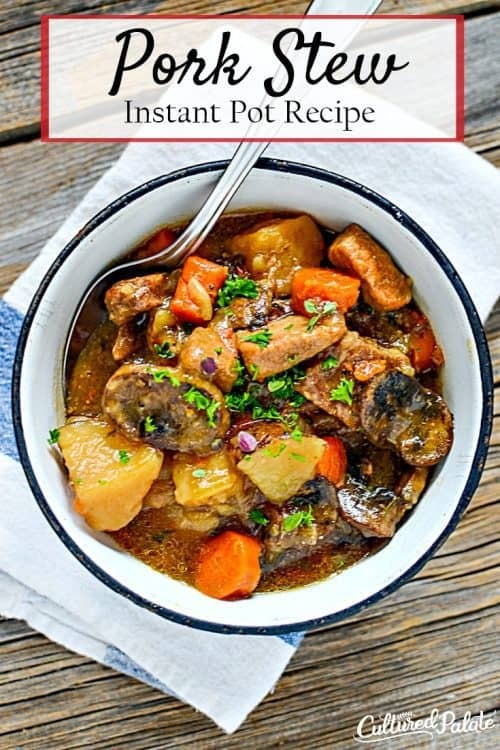 If you’ve tried this PORK STEW or any other recipe on Cultured Palate please take a minute to rate the recipe and leave a comment letting me know how you liked it. I love hearing from you! You can also FOLLOW ME on PINTEREST, FACEBOOK, INSTAGRAM, YouTube and TWITTER. Pork stew is delicious but one made in the Instant Pot is also quick and easy! Add oil to Instant Pot and press "Saute". Drop in the seasoned pork and allow to cook until you have a good sear on all sides. Stir continuously. After searing the meat, put in the chopped carrots, celery and onion. Saute for a few minutes until brightly colored and they are beginning to soften. Add the potatoes, mushrooms, spices and shake in the gravy mix over the top. Press “manual” button and set it for 20 - 25 minutes. When cooking time is up, do a quick release until the pin drops and all the pressure is released from inside the pot. Remove the lid and give it a good stir. If you find the liquid is not thick enough for your liking, simply press the saute button and add a slurry of 1 tbsp cornstarch and 2 tbsp water. Mix and pour into the stew - stir to thicken. What is your favorite stew recipe? Sorry but I don’t know what an “Instant Pot” is. Una, I updated the post with information. An Instant Pot is a multi-function kitchen appliance that can be used as a pressure cooker, crock pot, yogurt maker, rice cooker and more. I love mine and use it multiple times a week. I have the 8 qt Instant Pot and even though you may not need a larger one, you can make larger batches and freeze the extras. Also, I can cook as little as 1 cup of rice in mine. I hope this helps! I love beef stew and this looks so rich and flavorful. I love it! ChihYu, so glad you enjoyed it and I look forward to hearing more from you! SonShine, so glad you enjoyed it! I love the idea of using bell peppers and turkey stock! Stay warm! I used Pork Loin Roast, it was on a super sale & turned out delicious!!! Thanks, again! SonShine, so glad you enjoyed it! I love buying and stocking up with items are on sale – it is a great way to save BIG! Melanie, so glad it worked well and you enjoyed it! Do you have any recipe for the instapot ace blender? Nino, I am sorry but I do not. I had a most of a gammon joint left over and used that. The stew was lovely and yes I also used a pressure cooker for 25 mins. I used beef stock instead and some cider for taste, that was nice Dina-Marie. Median, I am so glad you enjoyed it – thanks for taking the time to let me know! The recipe doesn’t state when to use the thyme. Also, what type of gravy mix is used? There are many different kinds…. Tesa, thank you for bringing this to my attention. I have updated and clarified that the spices are added when adding the mushrooms and chicken broth. I just use the store brand gravy mix and think any would work well. I hope this helps!